A plan to distribute cameras to San Diego police officers to record interactions with the public received strong support from a City Council committee today. City officials hope the cameras, which can be worn on an officer’s uniform, will prevent some of the problems that have plagued the department in recent years, including alleged sexual misconduct. They can also protect officers from false claims of abuse. A plan to distribute cameras to San Diego police officers to record interactions with the public received strong support from the City Council’s budget committee. Photo from Wikimedia Commons. Financial staff recommended to the council’s Budget Committee that $2 million be set aside from the program. It was one of several suggestions on how to spend part of a $50.8 million budget surplus projected for the end of the current fiscal year, which ends June 30. Interim Mayor Todd Gloria said the uniform cameras will demonstrate to the public that the City Council is serious about dealing with the SDPD’s problems. 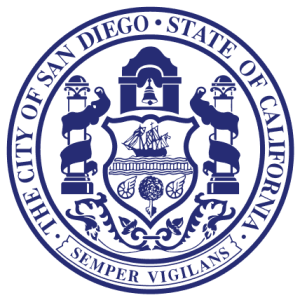 Around 10 of the cameras are currently in use by Central Division officers so the SDPD can identify the kind of infrastructure requirements — like data storage — that will exist for a full-scale rollout. Other spending recommendations from city staff include $10.1 million to cover increases in insurance premiums and claims, $3 million for improvements to the South Chollas Landfill, and a $1.3 million loan to cover cost overruns on a project to renovate the downtown waterfront. Smaller expenditures were recommended for adding nine recruits to an upcoming police academy, updating the city’s website, restoring funding that had been cut at the City Attorney’s Office and preparing the site of a temporary fire station in the Skyline neighborhood. Around $37 million of the surplus is available to spend over the next four months, and staff made $22.9 million in recommendations, which will be taken up by the full City Council next week. “Obviously, this reflects an improving financial reality for the city. It’s something we should celebrate,” Gloria said. According to a staff presentation, the city has around $61 million more in revenue than first forecast, due in part to higher property taxes and income from shutting down the city-owned Data Processing Corp. The higher revenues were partially offset by more than $10 million in extra expenses, including the mayoral elections and higher personnel costs. The staff report said the growth in sales tax revenue is less than expected. Also, Independent Budget Analyst Andrea Tevlin said hotel room tax revenues will need to be monitored through the rest of the year.